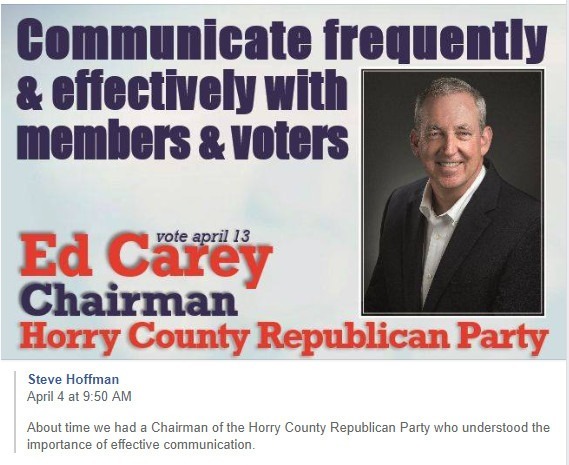 Murrells Inlet, April 8, 2019 – Steve Hoffman has announced his intention to endorse Ed Carey for the new Chairman of the Horry County Republican Party. The Party will have its biennial convention this coming Saturday at the Ten Oaks Middle School in Carolina Forest where new party officers will be elected. County…and we will always elect Republicans”. The Democrat Party now has its eyes on South Carolina. They are organized, well financed and one of their priorities is to turn Horry County Blue. Don’t believe me, just look at the Horry County Democrat Party web page, www.horrydemocrats.org. Their site is loaded with information on their organization, current issues, news, an events calendar packed with Democrat Party activities that are occurring each month throughout our county, and other information on how to donate your time and money to their party. It should be obvious to all that the Horry County Republican Party is in dire need of reform. Unfortunately, our current Chairman does not have the skills to reform the party. Worse yet, she does not have the leadership skills to get thing accomplished through people, she like to do things herself without delegating. The effort to reform our party will take hard work and dedication from a large number of executive committee members, precinct presidents, and volunteers from the Horry County Republican community. It will take a leader who knows how to motivate people to accomplish the necessary tasks and ensure that the HCGOP can effectively counter the Democrat Party threat. 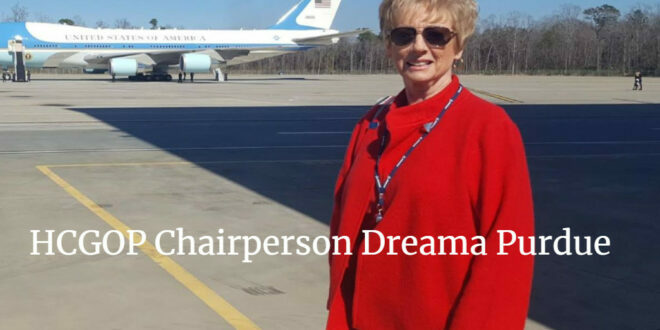 Again, I’d like to thank Dreama for stepping up to the plate during the party’s time of need two years ago, but it is now time to turn over the leadership reins to someone more capable of leading a large political organization. That person is Ed Carey. Next How MBACC wins state grants – is this criminal?